Do you telephone people less than you use to? Michael posted this question in Facebook, as you can see. The HR guy, where I used to work, talking about email, ten+ years ago, was telling me that he thought informal communication was suffering badly. In that respect email has transitioned into Social Media and has improved again. I have great friends that I have never met! I think the phone as a verbal device, is now the casualty. The phone is now the ‘Smart’phone which is predominantly a non verbal device but it is dominating communication. It will be interesting to see how that will swing back. That’s how it occurs to me. I was asked what this meant. We all vibrate – which is energy. If God is omnipotent and omnipresent, then God is everywhere all the time and is the energy (and it’s frequency) within you. If you become aware of your state or how you are being at any point in time you tune in. 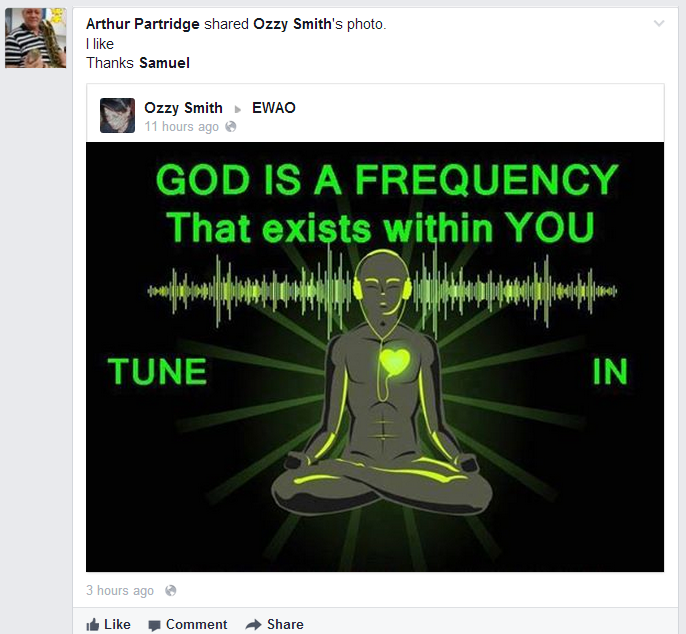 In which case you are tuning into God. In NLP terms we observe how when people internalise, they create their reality.